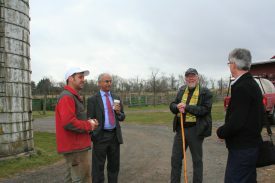 Share the post "NJAES Hosts Introductory Tour of NJ Agriculture for Chancellor Dutta"
New Jersey Agricultural Experiment Station (NJAES) executive director Robert Goodman and research director Brad Hillman led an introductory tour of New Jersey agriculture and NJAES off-campus research facilities for Chancellor of Rutgers–New Brunswick, Debasish Dutta, on December 5. The tour began with a visit to Readington River Buffalo Farm in Flemington, where owner and son of the farm’s founders, Erick Doyle, presented his agricultural operation. Doyle, who is a member of the New Jersey State Board of Agriculture, raises American Bison and practices agritourism. 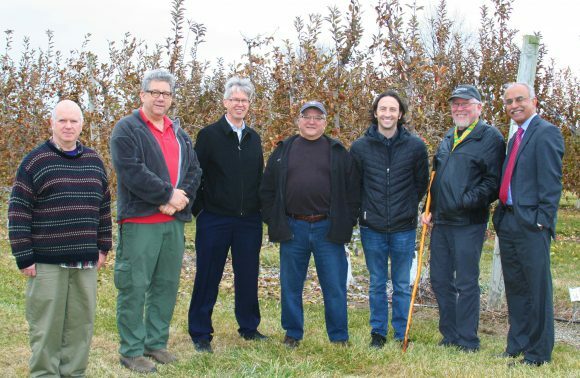 At nearby Rutgers Snyder Research and Extension Farm in Pittstown, Dutta was given an overview of the facility by director John Grande and farm supervisor Ed Dager. Over lunch, Department of Plant Biology members, distinguished professor Jim Simon and associate professor Tom Molnar, discussed their breeding projects, which are bringing new products on stream for New Jersey growers while enhancing existing crop lines as well as offering new niche markets. The tour concluded at Beneduce Vineyards, a family operation in Pittstown that practices sustainable farming methods. Family member and the winery’s event director, Justen Beneduce Hiles, is a 2008 graduate of Rutgers School of Environmental and Biological Sciences. Dutta, a strong proponent of the land-grant mission, acknowledged that supporting statewide agriculture is an integral part of the land-grant system and he will be engaged in learning more about NJAES research and extension. Upcoming tours for Chancellor Dutta will cover southern/coastal and central New Jersey farms and off-campus research stations and extension offices.